Most people purchase life insurance because of love. They have loved ones that could be affected by their death. Life insurance can be a huge financial relief for those that lose a loved one and need to pay not only the funeral costs, but all of the other day-to-day bills like the mortgage, the credit cards, or the car payment. Or, you may even be thinking ahead about your children’s college tuition, which can also be paid for with life insurance. If you’ve been thinking about purchasing a life insurance policy, you’ve probably noticed that there are two main kinds of life insurance: term and permanent. Term insurance is an affordable option for life insurance because it only covers you for a period of time, not your entire life and it doesn’t accumulate any cash value. When a life insurance company considers an applicant, they focus on the risk of that person and the likelihood of them filing a claim. Age and health are critical factors, so if you purchase coverage while you are young and healthy you can lock in a great rate for the duration of your term policy. When your term ends, your coverage ends. Policies often have terms available for 10, 15, 20, 25 or 30 years. Term insurance is designed to protect your dependents in the event you die prematurely. If you die within the term, your beneficiaries receive the death benefit. If you don’t die, there is no payout. Term life insurance is great for those that want to financially protect their loved ones for a certain period of time when you feel your family would experience the most financial devastation if you were to die. The payout replaces your income and can help your family pay for expenses that you currently take care of and even future expenses such as college tuition. Ideally, your need for term life insurance would end when the term expires. When your kids are grown and on their own, the house is paid off and you have money saved and a retirement plan. If you decide to extend or renew your policy at the end of your term, your premiums will be higher since you are older and most likely aren’t in the same health as you were when you first purchased your policy. There’s also a chance that you may be denied coverage because of health conditions. At this point you may want to consider a term conversion. A term conversion is when all or some of your term life insurance policy is converted into a permanent life insurance policy. Most term policies include a conversion option and allow you to convert to a permanent policy regardless of your health as long as you do so before the deadline on your current policy. Both types of insurance have their benefits. It’s a personal decision on what type you choose. Your age, financial situation and lifestyle factor into your decision. Permanent life insurance is a bit more complicated than term life insurance and is offered through a variety of life insurance products. We’ll discuss the most common type of permanent life insurance: whole life insurance. 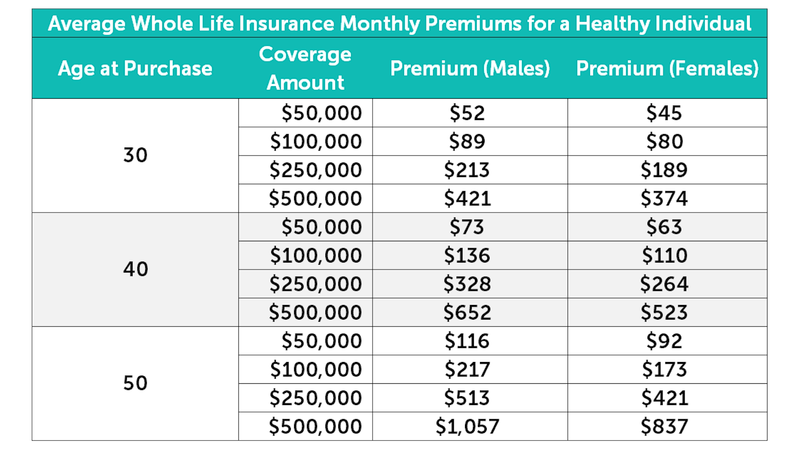 As a result of having lifelong coverage, you have higher premiums than term insurance. As long as you continue to pay your premium payments, you’ll have your permanent life policy until you die. With some types of whole life insurance products, the premiums remain the same throughout the entire policy. The policy is structured to be lifelong, and as long as you maintain the premium payments, the policy will be in force regardless of age and health conditions. While term insurance offers protection for a specified period of time, whole life insurance offers lifelong coverage. As you pay your premiums, your policy accumulates cash value. The value grows slowly and is tax deferred, so you don’t pay taxes on it while it’s accumulating. You can borrow money against the account or surrender the policy for cash. However, if you don’t repay the policy loans with interest, your death benefit will be reduced. If you surrender your policy, your coverage is surrendered as well. You only need life insurance to cover a specific period of time. You are unsure and may want a more permanent coverage in the future. Most term policies can be converted to a permanent coverage. Deadlines for conversions vary by policy, so if you have a term policy, it’s good to review it. You plan on spending your retirement savings, but still want to leave a legacy or money for final expenses. You need to create inheritance equalization. Perhaps you have land or a business that you plan on leaving to one child, you can provide a fair inheritance to your other children using life insurance. If you have a very large estate that you will be leaving behind, you may want to provide life insurance to help your heirs pay estate taxes. Without a life insurance payout, parts of your estate may need to be sold off to pay taxes. It’s easy to run term life insurance quotes on Quotacy.com. If you’re curious about pricing, go ahead and play around with our quoting tool without giving any personal information. If you’re curious about permanent life insurance, we have staff with years of experiencing putting permanent products in force as well. Contact us and we can help you determine what type of insurance is best for you. Whole life insurance would be beneficial to those who will have people relying on them for an indefinite period of time. For example, if you have a child with special needs or if you are caring for aging parents. In these cases, you should consider buying permanent life insurance coverage to protect them because you aren’t sure when they will no longer need your financial support. If you’re regularly contributing to savings and retirement accounts, term life insurance protection is ideal because it’s designed to drop off when your dependents are no longer financially reliant on you, big expenses like your mortgage are paid down, and you’re soon retiring. However, if you’re not a disciplined saver the common saying “buy term and invest the rest” may not apply to you. This strategy only makes sense if you’re actually investing that difference. If your discretionary income is just sitting in a checking account or you’re spending the extra funds on stuff you just don’t need then a whole life insurance policy may be a good asset for you. It’ll ensure that your loved ones have financial backup if anything were to happen to you and they have the necessary funds to take care of your final expenses. Another good option to purchase is a large term life insurance policy to cover big ticket items like your mortgage and children’s college tuition and then supplement it with a small whole life insurance policy. Whether you buy term, whole, or a little bit of both is ultimately up to you and it depends on your lifestyle and your financial situation. If you’re not sure what your life insurance needs are feel free to contact us here at Quotacy and our advisors can help you out. If you have questions about life insurance make sure to leave us a comment. And if you have any questions regarding today’s topic check out this blog: Which Is Better Term or Whole Life Insurance?. Otherwise, tune in next week when we talk about how stay-at-home parents can buy life insurance. Bye!